I don’t believe this, and said as much here last year (http://wp.me/pYql4-4b). For me, character is primary, and I also have a penchant for mystery. Action for action’s sake usually puts me off – I need to bond with Jake and Elwood before I care about the car chase. Yet the conversation started me thinking about the kind of books that instantly draw me in. When I got home, I pulled down some novels with openings I admire to look again at what the authors do. One of my favorite reads of the year was Suzanne Collins, The Hunger Games, a stunningly original story and beautifully written as well. It includes one of the best openings I have ever read. In four sentences, we learn a lot about who we’re dealing with: an articulate girl who notices details, loves her sister, does not have a father or very much money, and soon has to face something ominous called “the reaping.” We meet an appealing character, two mysteries (where is her father and what is a reaping), and an instant sense of dread. The opening of this best seller proves that you don’t need action to grab a readers attention: nothing “happens” except the narrator reaches out and finds her sister is not in bed. 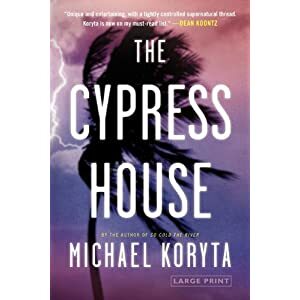 Another memorable book I read this year was The Cypress House by Michael Koryta. The first two sentences drew me in: “They’d been on the train for five hours before Arlen Wagner saw the first of the dead men. To that point it had been a hell of a nice ride.” Nothing “happens” except one man has a very unusual vision. This is admittedly a small sample of books that appeal to my taste, but they prove several points. Book openings are critical. It takes real art and sometimes sixty or seventy drafts to draw a reader into a story. At the same time, it is no more correct to say a book must start with action than to say that it can’t. There are lots of ways to pique curiosity and interest, and that is what it’s really about. This entry was posted in Authors, Book Reviews, Characters, Novels, Writing and tagged authors, book reviews, fiction, fictional characters, ghosts, Novels, stories, writing. Bookmark the permalink. The need to catch people’s interest quickly is why so many books start with a prologue before the actual story begins. While this helps, I don’t think it’s needed all the time. If I pick up a book, especially if it’s by an author I enjoy or a suggestion from a friend, I’m willing to put some time into the book and I don’t need an immediate hook into the story. On the other hand (to immediately contradict myself) it’s really annoying when a book starts very slowly. One of the last books that I stopped reading I put down after the first 150 pages because nothing happened. Even without finishing the book, I could tell that the first 150 pages didn’t need to be there. It’s a balancing act. Obviously there has to be a history to the world of the book you’re writing, but the question of where to start the book is a question of how much of the backstory you’re going to share with the reader. Start with the conflict for the character, we’ll learn the backstory of the world as we read the book. Strictly speaking, I believe in rules of thumb but not rules – your “contradiction” suggests the same thing. Also, the context of the discussion I described was a group of unknown writers discussing ways to make a good first impression, so that would rule out a writer you already know or a friend’s recommendation. I too, balk at prologues, as did most of the people in one of my critique groups when the issue came up. Prologues seem a little unsubtle – on the other hand, Twilight began with a prologue and you can’t argue with that kind of success. In the end I guess the only “rules of thumb” for writers I am 100% sure of are these: read a lot and write a lot. This was an interesting exercise. I think I’ll try it once I get caught up with things. I’ve noticed recently some contests (mostly contests on blogs) that will judge on the first 250 words. That gives little time to set anything up or in motion. It’s a frustrating trend. I entered one of those 250 word contests for several years in a row, thinking I had good beginnings, and had no success. It may be that my favorite books would not have won prizes for openings either. Interesting to look at though, as well as which first pages grab me when I’m prowling the aisles at a bookstore.